Synopsis: Rose is a practical girl. When the other orphans daydream about finding their parents, Rose dreams of getting a position in domestic service, of being independent, working hard, and earning a living. So when the housekeeper for a leading magician comes to the orphanage looking for a young housemaid, Rose is thrilled to be selected. Rose doesn't hold with magic, so when she begins to suspect that she may have some magic abilities, she is determined to get rid of them if possible. She just wants to be an ordinary person, and to fit in with the other servants, especially her new friend, the houseboy, Bill. But when someone starts stealing children off the streets, and Rose's best friend from the orphanage disappears, Rose teams up with the magician's apprentice, Freddie, his spoiled daughter, Isabella, and the magician's cat Gustavus to get to the bottom of it. 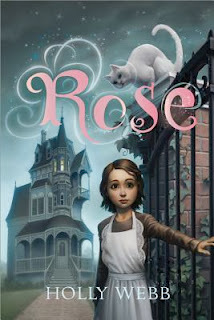 Review: Rose is a fun middle-grade fantasy with a delightful, no nonsense heroine. Practicality and imagination are usually portrayed as being mutually exclusive, so it's terrific to see a protagonist who has both in abundance. Young readers will identify with Rose's struggles to both find herself and fit in, two things which sometimes seem to be in conflict. I fell in love with Rose from the first page. The story is set in an alternate Victorian England where magic is real, although rare and expensive. There's a variety of interesting characters, and most are pretty well developed. The one exception is the villain, who's a pretty clichéd evil villain, and is really more of a story device than an actual character. It doesn't really matter, though, since the battle with the villain doesn't come in until later in the book. Rose is the real centerpiece of this story, and most of the book revolves around her learning to adjust to life outside the orphanage, developing relationships with the other members of the household, and coming to terms with her magic. This is an engaging book with a lot of kid appeal, and I would recommend it to young readers who enjoy a fun story with great characters and a little bit of magic, as well as those who enjoy historical and pseudo-historical settings. FTC required disclosure: Review copy given by the publisher at BEA to enable me to write this review. The bookstore links above are affiliate links, and I earn a very small percentage of any sales made through the links. Neither of these things influenced my review.